Want to receive our NEWS LETTER? Go to the CONTACT page and sign up! Some of our air cadets from 379 squadron went out to cemeteries in Alexandria to place Canadian flags at the headstones of WW1 soldiers who died while fighting overseas. We finally got a chance to hang up our sign at the Ball Park. We donated money to have new dug outs made. Members Donald Ducky, Robbie, Susan and Marius with the assistance of Keith and his welding skills got the job done. Thanks to Home Hardware for donating 2 fence posts. Member Anick made the design. We are having a fantastic draw for the Ted Rudolph Fund thanks to a generous donation from THE NORTH GLENGARRY restaurant. 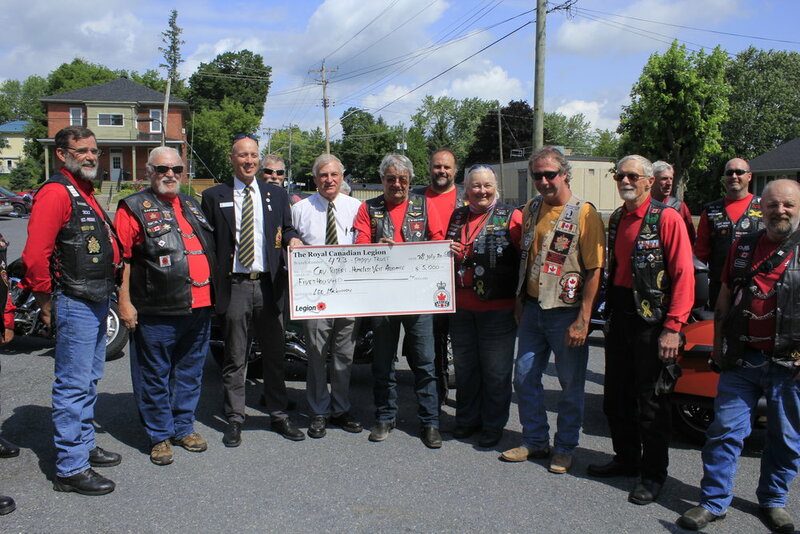 the 1st Canadian Army Veterans - Sicily Unit had their 7th Annual Poker run for the Homeless Veterans Assistance Fund and made their usual stop at our branch to receive the usual donation. It was a beautifull day! Our Washer Toss team (Rob McDonald and Ducky) played in the Legion Zone Washer Toss tournament and lost all their games… but they had a lot of fun! We had a Canada Day BBQ for the Ted Rudolph Fund. Our air cadets represented us in the Parade. Dave and Marius participated in the Legion Zone horse Shoe tournament in merrickville and ended up last! The Alzheimer’s Society had their Alzheimers Walk in Alexandria of which we were one of the main sponsors. We were present with an info booth and walked the first round with the special guests. Ivan Flaro and Rob MacDonald won our Charity Sunday: Cribbage tournament and donated the proceeds matched by us to the Ted Rudolph Fund. We had our first SUMMER SATURDAY BBQ. It was decided to put the proceeds of our BBQ’s in the TED RUDOLPH Fund. This is new and all proceeds will go towards the food bank at the end of the year. The branch historian of branch 641 Barrhaven came by with an exhibit with WW2 artefacts as a fundraiser for our air cadets going to the 75th commemoration of D-Day in 2019. A 10 day trip that will bring them to the beaches, Vimy and Italy. We had a Celebration of Life at our branch for our Member, Bartender and Friend Ted Rudolph. Lots of anecdotes, laughs and tears. It was a fitting goodbye to a great person! We are also on Instagram now! Click on the link on the bottom of this page. We had a succesfull Charity Sunday event with 24 Euchre players. Rolland Paquette was the winner with 96 points and he donated the proceeds matched by us to Youth unlimited in Maxville. We had a great Legion Pub Crawl where we visited the legions in Huntingdon, Ormstown and Valleyfield together with our friends from Lancaster. The Air Cadets 379 and Legion were promoted during the Journee de la Femme celebration at Le Relais High School. Our Pool Team (Andre and Ivan) competed in the Legion Provincials after winning the District (Lancaster) and Zone (Brockville) tournaments. They did not place for the Nationals due to very heavy competition. 1st Vice Dave handed out awards to the winners of the Legion Zone G Remembrance Day Poster, Essay and Poem contest. Laggan School: Kathi Auer (2nd, Essay), Lindsay McPherson (2nd, poem), Noah Osborne (3rd, Poster). St-Finnans school: R.J. Antipolo (3rd, Poster, junior), Trinity Doucet (3rd, Poster, intermediate). Executive Marius received the Canada Sesquicentennial Award for his volunteer work in the community, specifically his work in organising the Remembrance Day ceremonies. 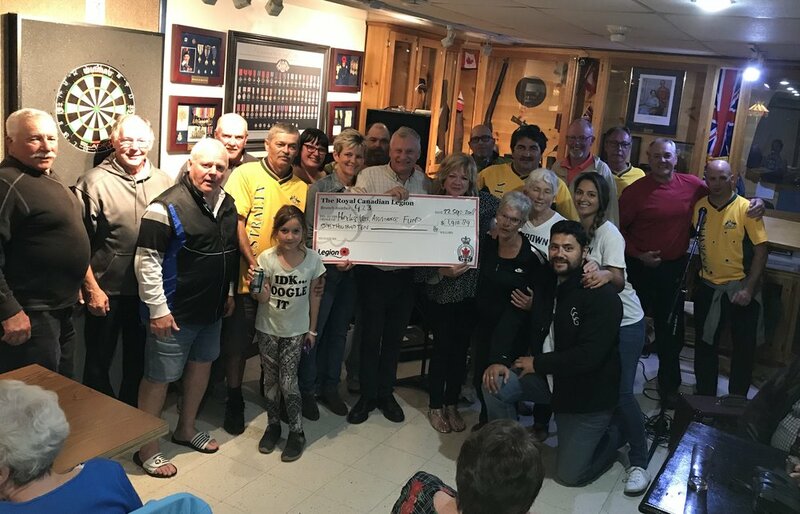 Our Yahtzee for Charity tournament was won by Marius and he chose the air cadets D-Day 2019 trip as charity of choice. They received the proceeds $70.- and the Legion matched so a total of $140.-. Our sponsor board has been mounted on the wall of the Glengarry Curling Club in Maxville.